Kettl co-founder Zach Mangan pours sencha green tea. Photo by Daniel Schwartz. Travel Loot is all about finding products (and the companies behind them) that inspire us to travel. Recently, we fell for Kettl, a contemporary tea company that operates out of New York City and has offices in Fukuoka, Japan. They sell high-quality wares and teas sourced directly from Japanese farms to high-end restaurants and stores in New York City and to everyone online. 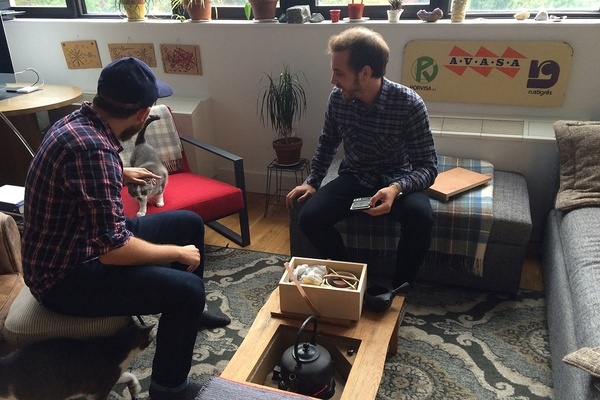 Fathom’s Becky Cheang and Daniel Schwartz visited co-founder Zach Mangan at his Brooklyn studio for a modern tea tasting and sneak peek at Kettl’s fall catalog. BROOKLYN – It’s stormy when we depart the office for our private tea tasting with Zach Mangan, co-founder of the Japanese tea brand Kettl. Heavy rains and strong winds make our ten-block walk from the subway feel more like 30. We arrive at his studio drenched, cold, and miserable. The door opens, and we’re greeted by a soothing Japanese melody and a beautiful cat named Panda. We feel better already. After peeling off our layers, we gather around a custom-made wooden coffee table with a built-in stove that Mangan brought back from Japan. He pours us a cup of houjicha (roasted green tea) from his Kuro Kyusu lidless pot. The design allows room for tea leaves to open and their flavors to come out, and eliminates the risk of breaking tea lids, the most common material casualty in commercial kitchens. The tea tastes woodsy and light and complex. The umami aftertaste we detect is unique to teas from the Fukuoka region. Daniel befriends Panda while Zach prepares tea. Photo by Becky Cheang. Over slow sips, Mangan tells us his story. He moved to New York City to pursue music, working part-time at Ito En, a Japanese tea shop on the Upper East Side. There, he befriended two businessmen from Fukuoka, Japan, after pouring them tea from their region from his private stash. The tourists were impressed with Mangan's knowledge of tea and invited him to Fukuoka. Mangan took the trip, toured tea farms, and, realizing that the best Japanese teas don't leave the country, asked his new friends to work with him. The trio started Kettl to share high-quality Japanese tea with consumers in the United States. Since then, he’s been back and forth to Japan many times, forming relationships with farmers, producers, and master blenders. Shortly before our meeting, he had recently returned from a summer trip with his Fukuoka partners of industry events like tea brewing contests and farm visits. We pepper him with questions, tapping his knowledge of tea production. We learn that green, white, black, and oolong teas come from the same plant and are differentiated in the production process. That tea farms and businesses are primarily located in the southern part of Japan, and that harvesting starts south in Kagoshima and moves north to Shizuoka. While harvest is in spring, usually mid-April to early May, the Japanese are able to produce tea year-round by keeping tea leaves in cold storage and processing them by demand. 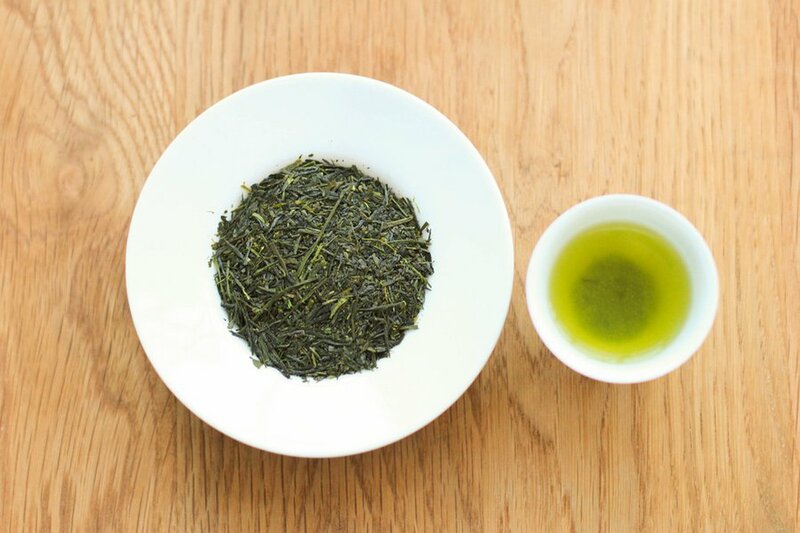 Our second cup is sencha, the most popular household tea in Japan. Mangan explains that most teas, including the one we’re drinking, are blends of several leaves of the same varietal from different farms. Leaves are picked by machine, processed, and brought to market, where they are inspected, smelled, and tasted by master blenders looking for certain flavor profiles to balance the year’s blend. Their goal is consistency, and they mentally mix flavors to ensure consumers don't detect differences in the tea they drink day to day. Next, Mangan explains Kettl’s philosophy. He wants to break common stereotypes about tea and make high-quality blends accessible to everyday drinkers in America. He respects the beautiful and meticulous details of traditional tea ceremonies, but doesn’t want people to feel like they’re having an inauthentic experience just because they’re drinking store-bought tea at home. 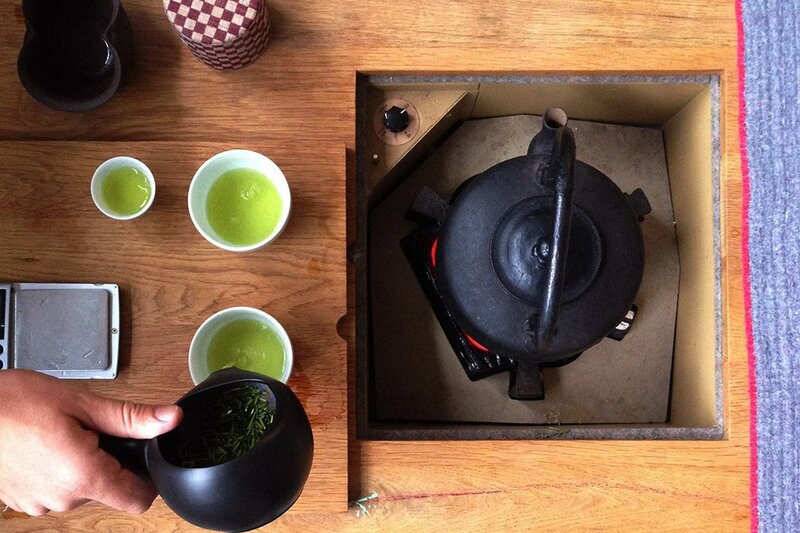 Instead, he pushes other aspects of Japanese tea tradition, like attention to quality and clean, uncomplicated design. 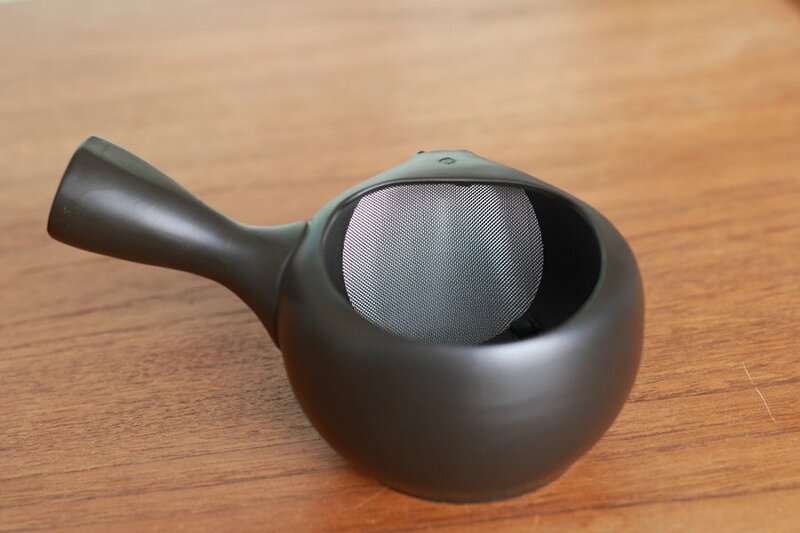 Kettl is an online business, but Mangan hopes to open a retail space to share his love for tea in person. For now, he hosts weekly pop-ups every Saturday at the second-floor gallery of Brooklyn Japanese kitchen Okonomi, where he conducts tastings and teaches guests about tea from his handcrafted Japanese serving cart. A matcha explosion. Photo by Becky Cheang. Mangan has a client meeting after our tasting (he has a growing list of partners, from Per Se to Mission Chinese to Seamore’s), but wants us to taste Kettl’s matcha. Before tasting, we learn that matcha leaves come from the common tea plant but are grown in low-light conditions to stimulate the overproduction of chlorophyll and other compounds that bring out its signature bright green color. They are then slowly ground in stone mills to fine powder. 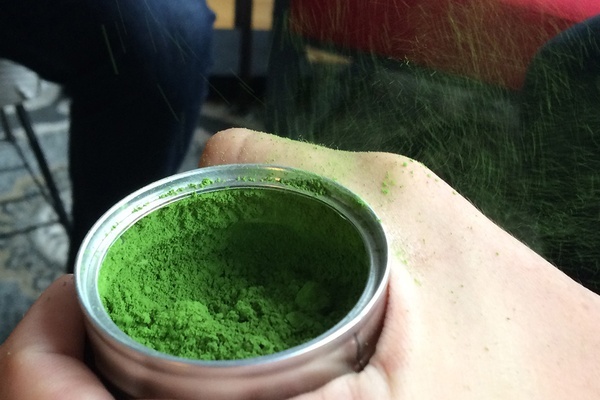 He pops open a tin can, creating a small explosion of bright green powder. In a sharing bowl, Mangan whisks matcha powder with water to create a foamy mixture. We take turns drinking and note the consistency — smooth and creamy, almost like espresso. We pass the bowl around as he shows us photos of the farmers who harvested the matcha we’re drinking. For a hot second, we're in Japan: soothing music, centerpiece kettle, playful cats, ceremony. It's time to part ways, and we step outside into the unrelenting rain. This time, the walk isn't as long and our pace isn't as hurried. We credit the calm to the time-out and the tea, which we can still taste, and wonder why we don't do this every day. Open Saturdays 11 a.m.–3 p.m. Bright, fresh loose green tea harvested in Hoshinomura Village, Yame, Japan on April 27th, 2015. 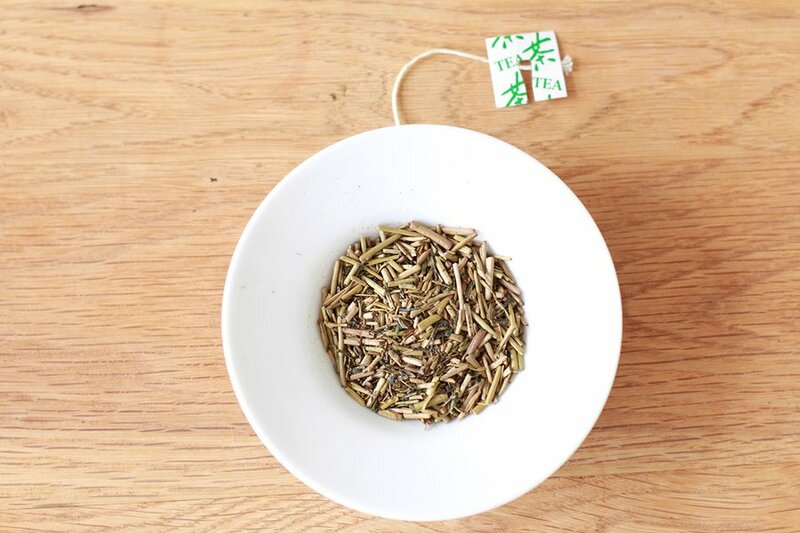 Roasted green tea that's light on the palette and naturally low in caffeine. 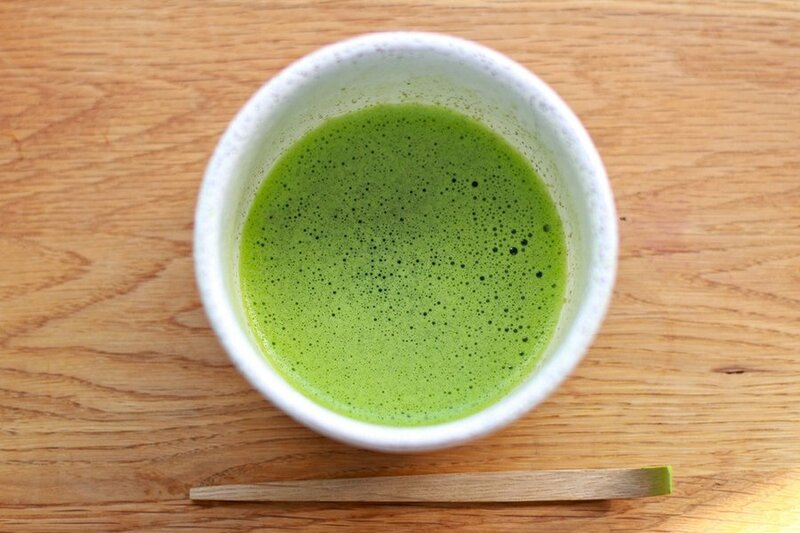 Thick, koicha-style matcha from Hoshinomura, Japan. A 13.5 oz. pot with built-in sieve from Tokoname, Aichi Prefecture, Japan. The old city is famous for its legendary pottery. A 13 oz. 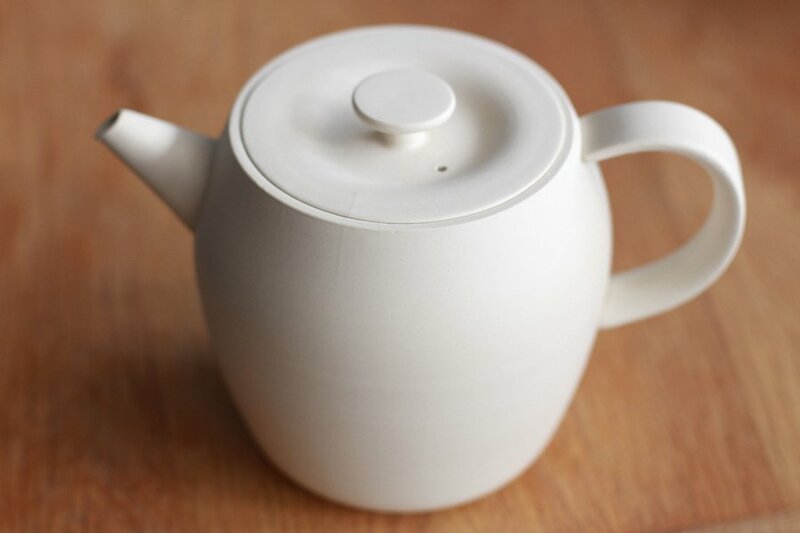 lidless pot custom designed by Shinya Yamaguchi, one of the finest tea producers in Japan. Not available anywhere outside Kyushu Island.